Yesterday, literate indie-rockers the Decemberists announced that accordionist/keyboardist Jenny Conlee had been diagnosed with breast cancer. According to a release from the band, she will miss the band's May and June shows. The full statement from Decemberists frontman Colin Meloy–and a note from Conlee herself–is below. The band's latest album, The King Is Dead, was released earlier this year. 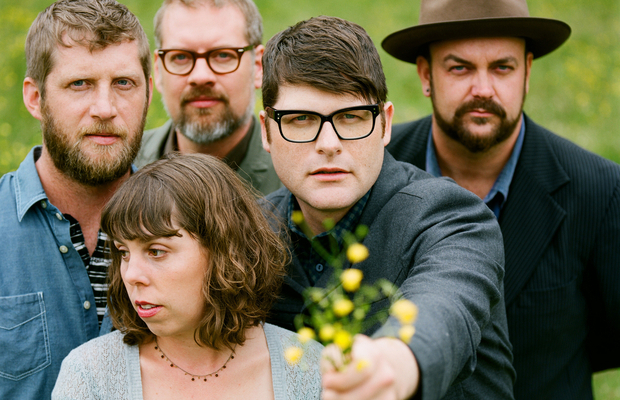 About a month ago, we all at Decemberists HQ got hit with some pretty hard news. Jenny Conlee, our since-the-very-beginning accordion and keyboard player and all-around rad person was diagnosed with breast cancer. If you or anyone in your world has been handed a similar diagnosis, you know what a bolt-out-of-the-blue this news can be. The good news is that Jenny caught it early. And while the prognosis is very, very good for a full recovery, tackling the disease will mean some intensive treatment for our Jenny as well as a lot of important recovery time. So I’m writing this to say that, weighing our options, and with Jenny’s fervent blessings, we’ve decided to go forward with our scheduled tour dates this spring and summer. What we know now: Jenny will very likely miss all nine of our concerts in May and June. We’re all hoping that her recovery will be such that she’ll be able to get back on board as soon as possible. I am very sorry to say that I will be missing a few shows coming up as I go through treatment for breast cancer. It has been great to be on tour these past few weeks. The band and crew are like family to me and have been incredibly supportive and understanding. To be making music with everyone and seeing the fans has helped me to feel more positive and keep my mind off of my diagnosis. But, alas, as the tour winds down, it is time for me to get back to reality. I will try to get into surgery as soon as I can after we return from this leg of the tour so I can begin my recovery. There are still a few unknowns out there concerning my cancer, but I am thinking positive and hope to be back on the road soon. Thanks for all of your support! See you soon! Thanks for everyone’s understanding during this crazy time.